Individual Volcanic National Parks are described here and via the links below. 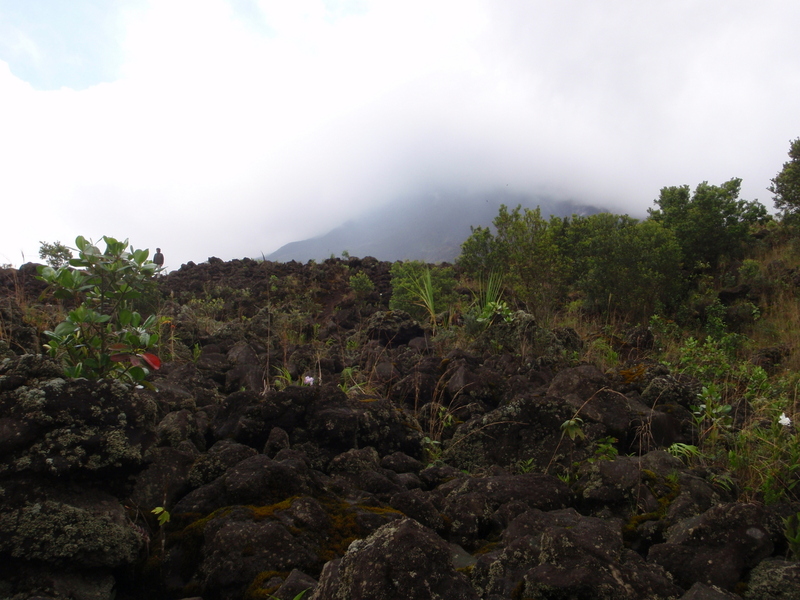 This lava flow from the early nineties has started to regenerate and is a great place to observe pioneer species. On the slopes of Arenal volcano. The geological activity that led to the formation of Costa Rica’s volcanoes continues today generating lava eruptions at Turrialba in 2015-2017 and the boiling mud pots, geysers and hot springs at Arenal, Irazú, Rincón de la Vieja, Tenorio, Miravalles and others. The plates that make up the earth’s crust are constantly in motion. Right now the plate off the Pacific Coast of Costa Rica is moving to the east. As the Pacific plate moves east it slides under and lifts the Atlantic plate in a process called subduction. A string of over 130 volcanoes creates the northern spine of Costa Rica fueling fumaroles, boiling mud pots, geysers, and of course natural hot springs that have been harnessed to create luxury spas like the famous Tabacón Gran Thermal in Arenal. Arenal is Costa Rica’s most famous volcano and until it went quiet its spectacular lava displays catalyzed the growth of an adventure tourism mecca of spas and eco-resorts. Arenal still boasts the most zip-lines, rafting rivers and canyoneering adventures and the main focus of the region is now hot springs. NOTE: Arenal volcano ceased visible eruptive activity several years ago and any pictures you see of red hot lava are from archives. It’s an interesting place to visit to see the way the forest regenerates after being destroyed by ash and lava. Turrialba, Barva, and Miravalles are protected but accessible by 4wd and on foot. Birding, hiking and wildlife watching are exceptionally good in the pristine rain and cloud forest national parks surrounding each. Tenorío is home to a perfect azure waterfall on the Río Celeste which is dyed by copper and other minerals released by the geothermal activity that also heats water in pools alongside the river to the bubbling point. Hikers adjust makeshift rock dams to control the mix of hot-spring and river water to achieve the perfect temperature for soaking their tired muscles. Poás and Irazú are the easiest volcanoes to visit. A museum, gift shop and visitor’s center at Poás, paved roads to the top of both and their proximity to San José contribute to their popularity. Visitors peer into the craters for glimpses of the azure lakes at the bottom and enjoy nearby coffee farms, waterfalls, butterflies and cloud forest trails. Sabaneros still ride the ranches on the slopes of volcán Rincón de la Vieja where you can spend a few days and join them on horseback, or hit foot trails to back country hot springs and waterfalls or if you’re up to the challenge all 11,000 feet to the crater.